Joseph Czapski, a Polish painter and soldier, was imprisoned by the Soviets after their invasion of Poland in 1939. For almost two years he was held in prison camps at Starobelsk, Pavlishchev Bor and Gryazovets. On 2nd September 1941 he was released. Nazi Germany had attacked the Soviet Union on 22 June 1941. An agreement between Stalin's Russia and the Polish government-in-exile in London, led by General Wladyslaw Sikorski, was signed in August 1941. This agreement saw Stalin grant an amnesty to all Polish citizens held in the Soviet Union. A Polish army, under the command of General Wladyslaw Anders, was to be formed on Soviet territory. 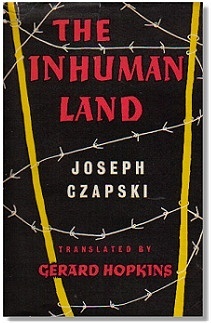 Joseph Czapski left the prison camp at Gryazovets along with 1,700 other Polish prisoners. They were marched 7 kilometres to the railway station. They sang Polish soldier songs. At the station they were told the train to take them on their journey would not arrive until the next day. They stood in the pouring icy rain. Thoroughly soaked they boarded their train at 5am. Their journey took them from Gryazovets, near Vologda, mid-way between Moscow and the White Sea, south through Russia to the Volga Steppes. All the railway stations were crowded with Poles who had been released from Soviet captivity. They were ragged figures dressed in threadbare foufaïkis (quilted coats). They had come from all over the Soviet Union and were heading south-west to join the Polish Army. On 8 October 1941 Czapski's train crossed the river Volga over the longest bridge in Europe. Eventually they arrived at a place called Totsk and walked 5 kilometres to a Polish Army camp which contained a small collection of wooden huts and tents. The weather at the camp was terrible. From mid-October until they left in January the temperature reached a low of -55 degrees centigrade. Save their comrades who had been left behind in the camps. Get news of their families deported over the entire Soviet Union. Joseph Czapski drew up lists of names and addresses of their relations. This information was then passed to the General Staff of the Army and the Polish Embassy. He also asked the new arrivals if they knew anything about the Polish Officer prisoners held at Starobelsk No. 1, Kozelsk No. 1 and Ostashkov. Nobody had any news of them. Nothing had been heard of them since they were evacuated from the camps by the Soviets in April and May 1940. There were rumours that Polish officers were held in the Arctic regions and in Kolima, in the far east of Russia. In the hope of saving these men Czapski took his records to Polish Staff HQ in Buzuluk. He met the Chief of Staff Colonel Okulicki. Okulicki ordered Czapski to draw up a detailed report stating all he knew about the men at Starobelsk, Kozelsk and Ostashkov. Early in 1942 Czapski left for Moscow with letters of introduction to the high dignitaries of the NKVD. The letters stated with great firmness that the promises made by Stalin about the release of all Polish prisoners should be implemented. Before travelling to Moscow he met with Ambassador Kot at the Embassy in Kuybyshev. Upon arrival in Moscow Czapski took his letters of introduction to the Lubianka, NKVD HQ. After many days he was told to report to the Lubianka for a meeting with General Reichman. Czapski told Reichman that only 400 of the 15,000 officers at Starobelsk, Kozelsk and Ostashkov had been accounted for. Reichman said he knew nothing about this but for the sake of General Anders he would look into it. Twelve days passed before Czapski received a late night telephone call from Reichman telling him that all documents relating to Polish prisoners had been passed by the NKVD to the Russian Foreign Office. Czapski told him that the Polish Ambassador had applied eight times to them for information without success. By the time Czapski returned from Moscow to Kuybyshev the Polish Army had been transferred south to Turkestan. The new Polish Army HQ was located at Yangi-Yul, close to Tashkent. Czapski travelled to Yangi-Yul to resume his duties. Czapski received some new information. He learned that the Bolsheviks in October 1940 had asked a Polish Colonel called Berling to form a Polish Army under Soviet control. Berling agreed to form the army and asked that the Polish prisoners formerly at Starobelsk, Kozelsk and Ostashkov be part of that army. The reply from the NKVD was that: "No, not those men. In dealing with them we have been guilty of a gross error." "You know, I think of them all as comrades and friends whom we have lost in action. (p. 164). In April 1943 the Germans announced that they had found a mass grave at Katyn in Russia. The grave contained the bodies of thousands of Polish Officers. Joseph Czapski's search for the Polish officers had been in vain. In March 1942 the Soviets cut the rations issued to the Polish Army to 26,000. The Polish army had 75,000 men and it was growing every day. Stalin wanted to cut the number of Polish divisions from seven to three plus a reserve regiment. The excess men would be sent back to the collective farms, mines or labour camps. The news that Poles would be evacuated from the Soviet Union led to increased numbers of Poles flocking to the Polish camps in Turkestan. To create conditions which would make it really possible for us to build a modern Polish army. To save as many persons as possible. In July 1942 Joseph Czapski became ill with both typhus and malaria. By the time he was released from hospital at the end of August the evacuation of the Polish Army to Iran had been completed. Only a skeleton staff under the command of General Szyszko-Bohusz was left. Czapski travelled by train to Ashkhabad, on the frontier with Persia. He spent one day there before crossing the border into Persia. Some of the seriously ill Polish children who had escaped from the Soviet Union were cared for at the American hospital in Meshed, Persia. The lack of nourishment and tropical diseases had taken its toll on them. Joseph Czapski visited the hospital and was shown the body of a child who had died that day. He would be buried the next day in the Armenian cemetery, in a small packing case, as there were no more coffins left. The priest Abbé Cienski officiated at the child's funeral. The priest said the last prayers for the child who had died exiled from his homeland. The Poles had finally left the Inhuman Land. Publisher - Published by Sheed and Ward, New York, in 1952; ISBN 0850651646; translated from the French by Gerard Hopkins. Republished by the Polish Cultural Foundation in 1987. Republished by The New York Review of Books in December 2018. This page was added on 05 February 2012. Updated on 19 December 2018.